On Tuesday, Oklahoma's House voted unanimously to make Swing Low, Sweet Chariot the official state gospel song. No other state has an official religious song. 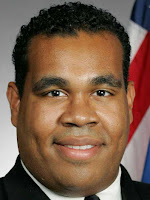 When state Representative Jabar Shumate of Tulsa (left), the Oklahoma bill's House sponsor, was asked by a colleague to give a rendering of the song on the House floor on Monday, he declined, saying his pastor told him to always sing solo -- "so low nobody can hear." Even without a performance, no one voted against the song. "Swing Low Sweet Chariot" was written in 1862, when Oklahoma was still Indian Territory, by a Choctaw Freedman named Wallis Wallis. It's said the Red River made Wallis think of the Jordan River, and the song was loosely based on a Bible passage that describes the Prophet Elijah being taken to heaven in a chariot. "It should be a source of pride to all Oklahomans that this meaningful song was written in our state," Shumate said. Gov. Mary Fallin signed the bill into law last night.